Please be sure to store your detector in a warm place. Avoid allowing it to be stored below 40 degrees! The difference in the Lumber Wizard vs other types of wands is the ability to auto tuning and a laser line indicator. Other metal detectors with autotune features do not detect as accurately since they can't be tuned to a very specific level. Those types are typically used for security and they are commonly used to detect huge metal objects such as weapons. The Lumber Wizard 5 is now made to tune automatically and to better detect wire, nails, screws, and small pieces of metal. Thus the importance of tuning often. Think of it as sharpening a blade! Works On All Types Of Woods, Particle Board and Solid Woods. Detects Nails and Screws Inside All Types of Wood. The New LUMBER WIZARD 5 Auto-Tuning Laser Line Woodworking Metal Detector is the latest version of Wizard Industries' flagship woodworking metal detector. 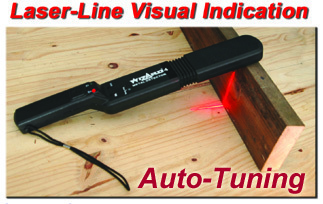 A powerful precision hand-held auto-tuning metal detector designed specifically for woodworkers, It helps detect small metal objects hidden inside new or used lumber. The new version features easier one-handed use, with automatic tuning every time the unit is turned on, and better false-positive rejection. Undetected nails, screws or other metal fragments can damage expensive jointer, planer and saw blades. Flying metal can also cause serious injury. Easy to use, the LUMBER WIZARD 5 Laser Line Metal Detector helps woodworkers prevent equipment damage and personal injury. The unit includes a vibration alert, allowing use of the LUMBER WIZARD 5 Laser Line in noisy workshops. The LUMBER WIZARD has received rave reviews from woodworkers and magazines across the country for many years, and the new version is even better! The most powerful woodworking metal detector made. Dimensions: Length 15 in., Width 3-1/8 in., Height 1-1/8 in. Weight: 13 oz. Detects nails, screws, wire, bullets and other metal objects buried inside of recycled wood. Types of Metal Detected: Responds equally well to all types of metal, steel, stainless steel, zinc, magnesium, and aluminum. Locates, nails, screws, staples, tacks, bullets, wire and other small metal objects that can destroy or damage planer, jointer and saw blades. Electronics: Unit operates with an automatic tuning transmit/receive circuit. Operating Frequency: 13 kHz / 6,600 Hz. Power Requirements: One nine volt battery; standard alkaline, Typical battery life is eighty hours. Switch: On / Off and stay on switch. Alarm Indicators: Piezo tone beeper and LED RED light indicator are used to indicate the presence of metal. Low Battery Indication: When battery drops down to 6.0 volts the unit operates with a warble tone and flashing light instead of the normal steady tone and light indicating a low battery. The unit will operate properly as the battery drops well below 5 volts. Once below 3 volts units will emit constant beep tone until unit shuts off. Built by Wizard Distribution July, 2016.